Stephen Fry: Wordsmith, provocateur extraordinaire, stupendously intelligent, extraordinary wit, deliciously good author and person with bipolar. Stephen has cyclothymic disorder, a mild form of bipolar where a person has mood swings over a period of years that go from mild depression to euphoria and excitement. Fry affectiontally labelled his bipolar “bipolar lite”. Stephen Fry was troubled at school and nearly got expelled many times. His depression started to surface during his school years although it may have just looked like bad behaviour. At the age of 17 he was suicidal and attempted to kill himself. All of them suffered different forms of severe depression in their lifetime. Depression tends to be prevalent amongst those gifted with both intellect and creativity. Consistent with many other bipolar stories, such as Linda Hamilton, it took many years before a proper clinical diagnosis was given to Stephen Fry. He received the diagnosis at the age of 37. If a week is a long time in politics, then twenty years is an eternity for someone with mental health problems, as these years are often spent in confusion, fear and pain. One of the keys to recovery from depression is receiving an accurate diagnosis. In 1995 Stephen Fry came very close to committing suicide by gassing himself in the car. According to The Independent, he had been starring in a West End Play but vanished after critical reviews. He contemplated suicide before going missing in Europe for a week and then received psychological treatment in the US. This treatment set him in the right direction for a better understanding of the nature of this condition and how to manage it more successfully. In the video Stephen Fry likens the experience of being depressed to like being a storm – you can’t choose to see the sun when it’s raining and cloudy. 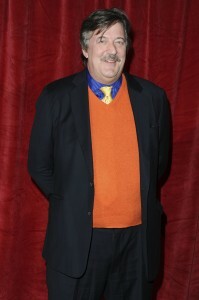 After making a solid recovery Stephen Fry has received much fame and renown. He has won many accolades for his efforts to raise awareness for gay rights and bipolar. He writes books, hosts TV shows and documentaries and keeps feeding his massive twitter following with humorous observations on life. We commend his work in championing the cause of mental health and wish him all the best in his recovery as he continues to enrich the lives of millions. Stephen does a lot to destigmatise the bipolar condition. He is chairman for Mind, a key mental health organisation and also works with Stand to Reason, another great organisation promoting mental health and social justice. After his near suicide attempt in 1995 Stephen embarked in a long course of psychological treatment as he game to grips with better understanding and managing his condition. We highly recommend viewing the documentary The Secret Life of the Manic Depressive, as it documents his recovery and insight into his condition. Stephen Fry is a prolific worker with talents in many areas. He also is very keen on technology and communications and loves listening to Audiobooks. Doing work is critical to recovery from depression, see our section on unemployment to see why this is so. Or, if you would like to submit a story which can change and influence other lives please contact us so we can share your story.